SA-SO's traffic cones can help you create a protective barrier that directs drivers and pedestrians. Our PVC molded traffic safety cones are available in orange, lime, and white. Choose MUTCD-compliant cones with or without reflective collars. Our standard traffic cone is 100% PVC injection-molded, stacks well, and has a specially-designed cleated base that grips the road. 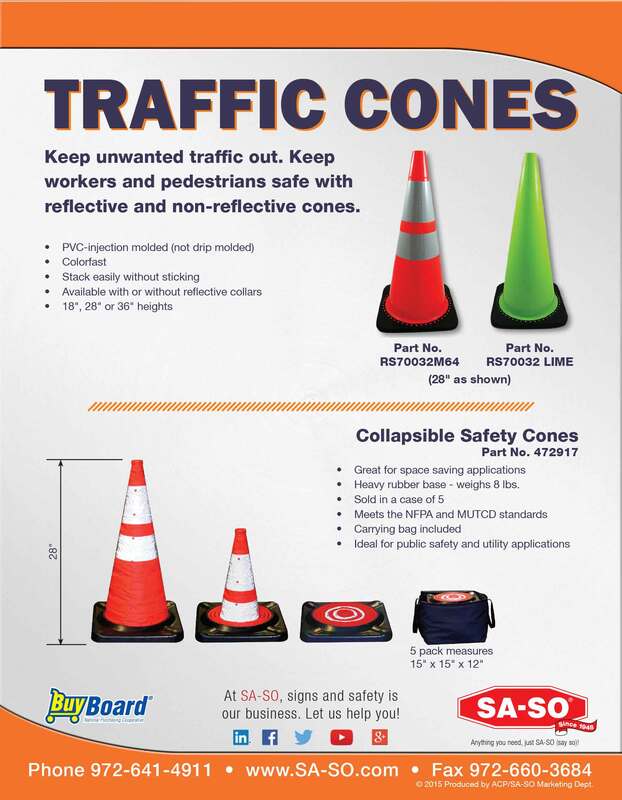 SA-SO also offers space-saving collapsible safety cones, custom-printed message cones, and Snap-On signs for traffic cones to turn them into signs. Nothing gets attention like SA-SO traffic cones! - They stack well and have specially designed cleated bases that grip the road. - Use our brilliantly colored cones to create a protective barrier for people and property. Please note: Due to their bulky nature, traffic cones typically ship at a higher rate. - 5 pack measures 15" x 15" x 12"
- Turn your cones into signs. - Our Snap-On Safety Signs work with all sizes of cones. Change messages in a snap with SA-SO Cone Snap-on signs! Description ...Do Not Cross Part No.